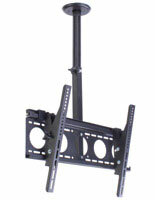 A TV ceiling mount goes where no other mounting bracket can. 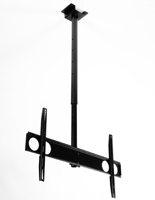 Certain applications require overhead display, and our collection of flat panel fixtures offers great selections for any industry. 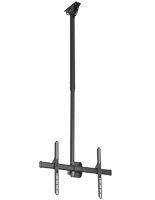 Where are these commercial TV ceiling mounts commonly seen? Any place where there are large public spaces with lots of people. At the airport, flight schedules and statuses are on display 24/7. Bars and restaurants not only need to have the games on, but also provide patrons with a dedicated screen for playing keno. Casinos apply TV ceiling mounts throughout their gaming rooms that offer gambling promotions, food and drink specials, you name it. Financial institutions provide a constant stream of digital content for customers waiting in line. 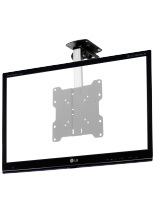 The one theme in common is the need for overhead display of flat screen TVs. 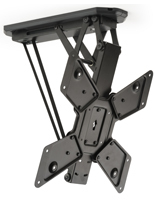 How many styles of hanging TV brackets are there? 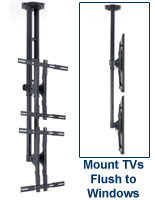 TV ceiling mounts come in single and double-sided versions. 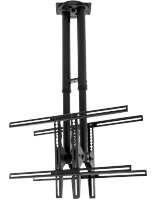 If you are placing a flat panel TV in the corner of a room, then a single-sided model is your choice. 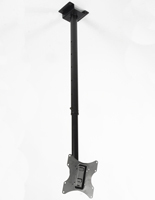 When mounted in 2-way corridors and halls, the need for a two-sided fixture is obvious. 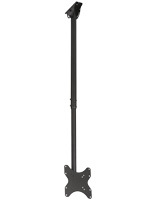 There are unique hanging fixtures that place the screen flush against windows. Retailers with store window displays sometimes like to hang flat screens right up against the inside of the glass for sales promotions. The same can be said for banks that display interest rates and other daily changing content for passersby on the outside. 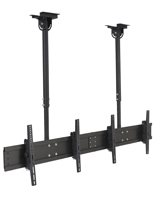 These hanging brackets offer the most adjustability out of any TV mounting style. 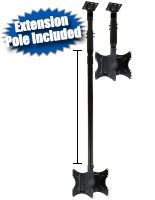 The support poles adjust screens up or down. 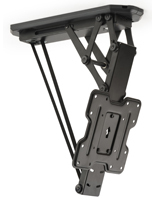 The brackets offer tilt features for beneficial viewing angles. 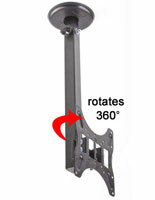 Lastly, the fixtures can swivel 360° for pinpoint placement. 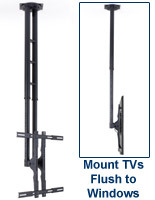 What extra features should you look for in an overhead TV mount? VESA compatibility. 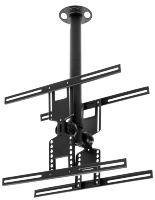 All of our universal TV brackets meet VESA standards, which assure that a television and mount may be used together. Heavy-Duty steel construction. 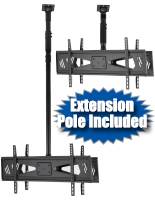 Any overhead application has to be able to handle the weight of one or more screens without fail. 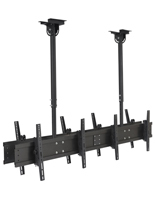 When using a ceiling TV fixture it is important to consider its installation. 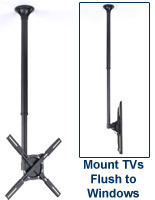 Whether the mount holds one or two flat panels, we're talking about a lot of weight. And all of that weight is concentrated on the end of the support pole at the mounting flange. Screwing into the ceiling with such a small area has to be done professionally. 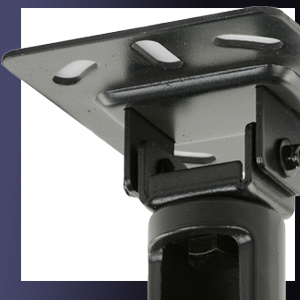 Care must be taken to ensure the flange is screwed or bolted into a solid surface.